People often associate “Pay-To-Play” with activities that require the exchange of money for services and although this is true, there is more to this term than meets the eye. Facebook Ads, for example, is a perfect representation of “Pay To Play” and is what most think of when hearing this term, but the phrase is also used to describe individuals and companies engaging in certain activities where money is not involved. To be recognized as a strong competitor, “Pay To Play” must be better understood and added to marketing strategies. Some brands end up going astray by not knowing all there is to know about “Pay To Play. They often get lost among the marketing dollars aspect and forget to take the time to review, understand, and incorporate all the other contributing factors that make-up “Pay To Play.” Let’s be clear, money is a huge component, but, it is imperative to know that it is not the only one. There are three other main parts to the “Pay To Play” process and each has their own marketing value when utilized properly. To have a brand that creates buzz and is memorable among audiences, it must be viewed as relatable, reliable, and easily recognizable. Ensuring the brand’s message is correctly being shared means dedication to producing unique content and deliverables that represent the brand well. This includes, creating, designing, and sharing quality blog posts, videos, images, reviews, and relevant articles, all of which, requires the investment of time and energy. This also applies when conducting audience research, building relationships, and developing loyal customers. When both time and energy are used for marketing or branding, it is how we “Pay” to play when money is not involved. The thought of simply placing money on a Website or Google Ad to reach goals and to gain desired results is nothing but a dream if the quality of the content is low. To ensure allocated marketing dollars for Ads are well spent and will receive long-lasting results, time and energy must be placed on the quality of each piece of content shared. The third and final contributing factor of “Pay To Play” is known as “Quid quo pro” or Reciprocal Exchange. Making an effort to interact with others, to show support, and to engage with audiences is often undervalued and extremely under-utilized. Having the “I’ll scratch your back if you scratch mine” mentality and engaging in the content published by others is required to see results from the content you produce. Every “Pay To Play” component is necessary for weaving a strong marketing web that catches and holds the attention of possible customers. It is very evident “Pay To Play” is much more than budgeting and spending marketing dollars. It is also about making time, using energy, and in engaging with others. 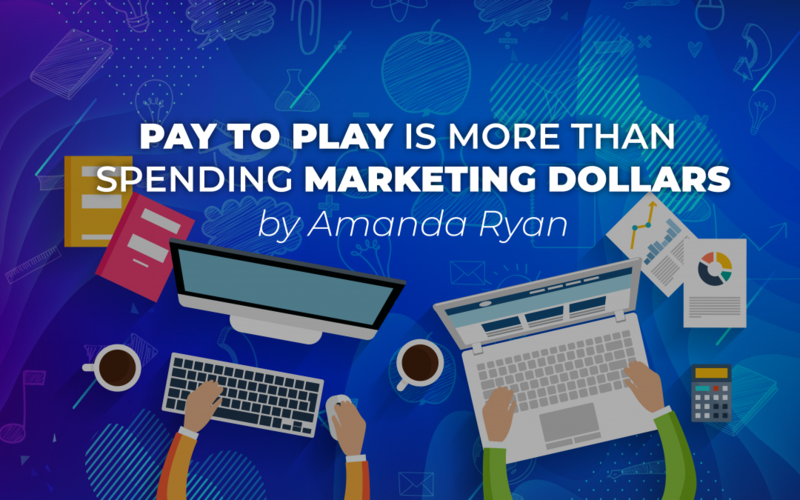 Adding more than just the money component of “Pay To Play” to marketing strategies will help generate leads, build trust, sustain loyalty, and convert prospects into paying customers. “Pay To Play” will also help in developing a positive image and send the message to your audiences that your company or brand is not solely invested in money, but in people too.